Are you tired of having to fix your hair before you go out to a costume party? Just for once, we'd love to be getting dressed up, and look in the mirror to find our hairdo is perfectly styled and colored the way we wanted it to be, so all we'd have to do is toss on our costume and head out the door! That isn't too much to ask, unless you happen to want your hair to look like a fabulous ball of cotton candy, in which case, it might be a tough trick to pull off. 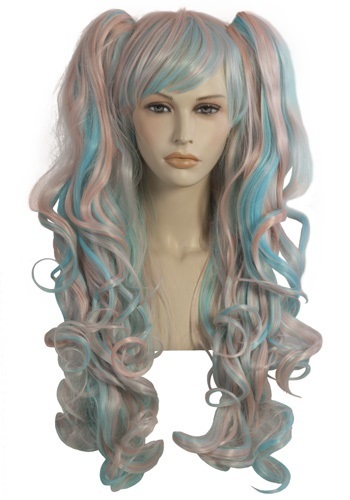 Luckily, that's what this colorfully cute Candy Wig is perfect for! The next time you're dressing up as a sugary candy fairy or a party girl with a sweet tooth, just slip on these bright pink and blue pigtailed locks, and your hair will look perfect! Pretty sweet, eh?